Serving a Pasta Salad Bar is a cool and easy way to serve a crowd of varying tastes. 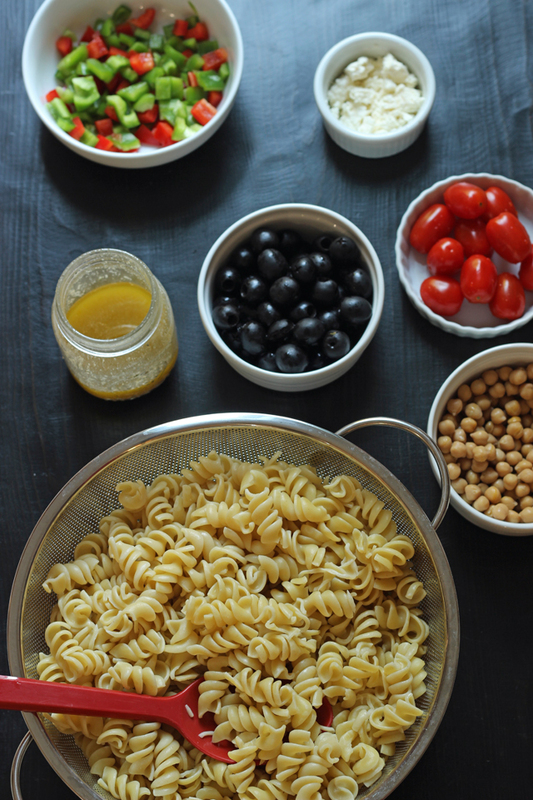 Provide cooked pasta and toppings so each can make his own pasta salad. I tend to serve dinner one of two ways: individually plated or buffet style. Our years of having babies and toddlers at the table got us out of serving family-style. I just wasn’t willing to let a toddler help himself. Nowadays, without tots about, we still serve buffet style. My kids haven’t quite mastered the art of passing the potatoes. So buffet style it is! How Do I Make Pasta Salad? Here’s how you, too, can feed the masses easily while keeping your cool. Cook up a big pot of pasta. It’s best to choose something small, like rigatoni or penne. Rinse and drain and set aside. Bonus: you don’t need to keep anything got. Mix up a big jar of dressing. Making your own vinaigrette is super easy. Just assemble vinegar and spices and herbs in a jar. Cap and shake. Add olive oil. Cap and shake again. And making your own dressing is just one of six ways you can save money on your groceries. What Can I Put In A Pasta Salad? The point of the pasta salad bar is to let diners choose what they want in their pasta salad. Lay out a variety of toppings for them to choose. I usually make these low fuss. Choose from these options or dream up your own. Pull out a medium mixing bowl (or two). Now the point of the pasta salad bar is that each person can mix his own personal pasta salad. We like doing the mixing in a bowl larger than a dinner plate. A bowl makes it easier to mix up all the ingredients. However it’s important not to use too big of a bowl. Your people might end up mixing more than they can eat. Ask me how I know! If that happens, just have them put their leftovers in a food storage container, and you’ve got a perfect lunch for school or work. In fact, setting up a pasta salad bar like this is a great way to get a few days of lunches packed. You can make each day’s salad different from the others and each brown bagger can have what he wants. 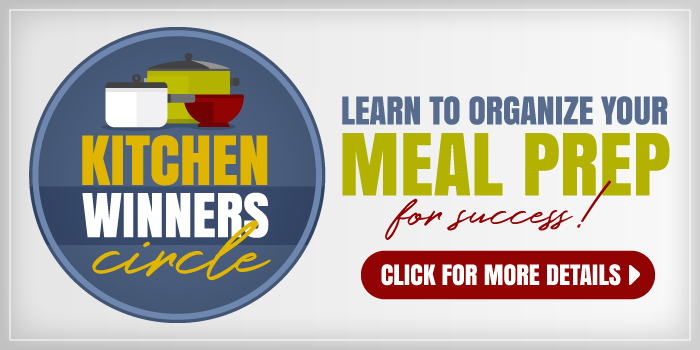 Waste less, and enjoy great lunches away from home! 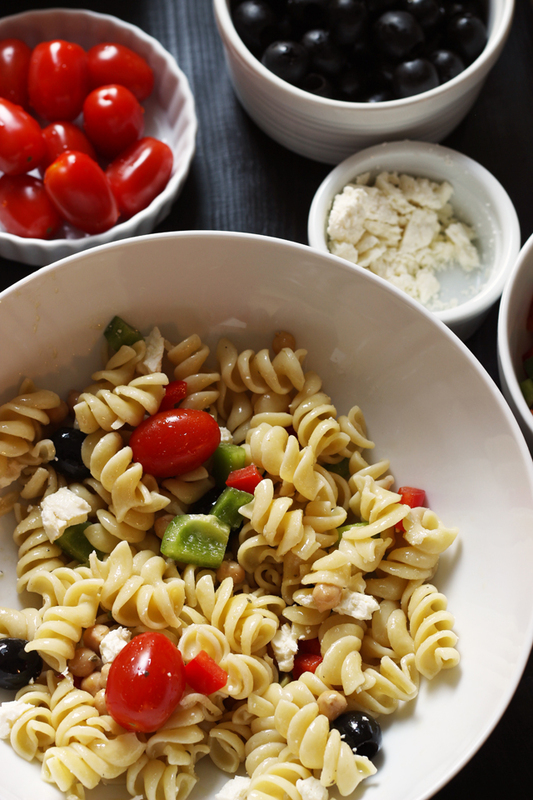 What’s YOUR favorite pasta salad mix-in? Originally published August 20, 2015. What a nice way to serve your family a dinner salad. I’m sure everyone has fun picking out what they want for their own salad. Since it’s only my husband and I, it’s easier to just make a big bowl of pasta salad. But if I had my whole gang over for dinner, I would definitely do this. As far as my favorite thing to go in pasta salad, I like everything, tomatoes, onions, peppers, olives, cuccumbers, cheese, and every single thing on your recipe ingredients list. It’s hard to narrow it down. 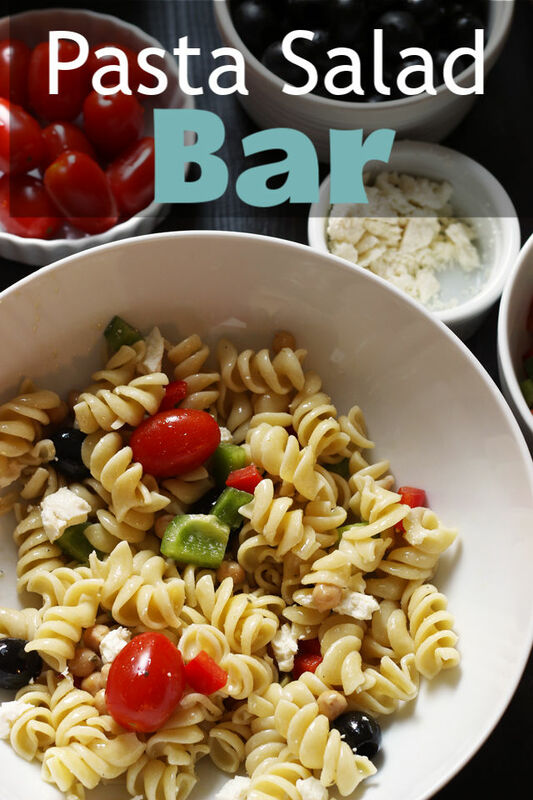 I love the idea of pasta salad bars. 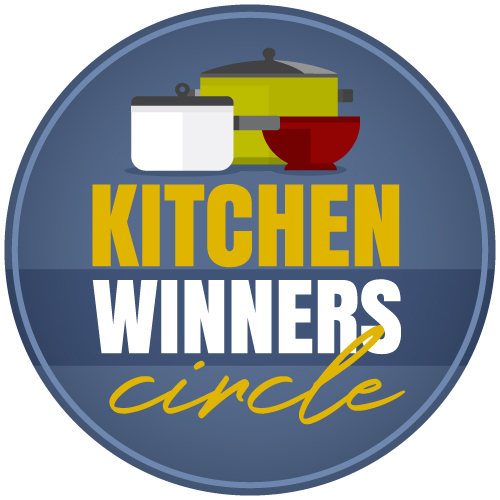 They’re a fun way of having dinner with the family, and I love the cozy informality it brings when you have friends over for dinner. Certainly informal, but effective so folks get what they really want. Good Friday afternoon! I’m missing your posts “Grocery Geek”, I love seeing what all you’ve bought. Are you just taking a break from it for the summer? Thanks, Coleen! I have had a hard summer, and was just diagnosed with hyperthyroidism with autoimmune processes. So, now we know why the summer was hard! haha! I hope to bring it back in September if I feel better. Thanks for asking! Ahhhh, I hope you start to feel better soon…..
Here’s another “duh!” moment for me. Thanks for telling us about the fantastic ideas that should be obvious, but apparently aren’t. Love this idea! We like to do a variation of this but hot. Warm noodles in one bowl and a variety of other toppings in the others – sauteed mushrooms, onions, peppers, olives, bits of meat or meatballs, diced tomatoes, parm and other cheeses, etc. I also have a bowl of warm red sauce. 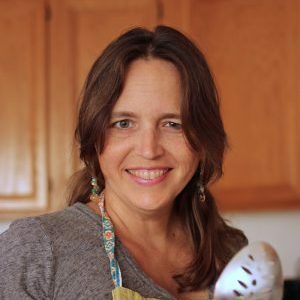 My kids love the options and it’s a great way to use up leftovers in a way that doesn’t feel like I’m just cleaning out the fridge. What a lovely reminder! I also like to make pasta salad with salmon or ham for the meat and usually add either chopped pickles or relish. Chives also make a nice addition to pasta salad, I think. I sometimes add cooked chopped broccoli or add frozen broccoli to the pasta while cooking. I will also admit to adding onion powder when I don’t want to take the time to chop regular or green onions. I usually do a creamy dressing with mayo, sour cream, etc. a bit like ranch, but without all the herbs. With just two of us I just make a basic pasta salad and add the extras my husband isn’t fond of when I’m having the leftovers for lunches. Since creamy dressings tend to be absorbed by the pasta, I add a splash of vinaigrette the day I eat the leftovers. Admittedly I use the creamy dressing very sparingly when the salad has it’s original debut. Served this tonight and my luckiest water was complimentary. Great idea. Thank you. Yikes. That was meant to be: my pickiest eater. Yay for picky eaters being complimentary!